The seal with netting deeply embedded in its neck. A young grey seal found entangled in monofilament net has suffered an agonising death in Shetland despite efforts to save it. Volunteers from Hillswick Wildlife Sanctuary were called to Britain’s most northerly beach at Skaw, on the island of Unst, where the tragic seal was found by a Shetland Wildlife tour group with netting deeply embedded in its neck. They successfully caught the seal and cut it free, but it sadly died. The volunteers were then immediately called out to deal with a second seal tangled up in netting on a beach at the other end of the islands. Jan Bevington said: “In the past week alone we have received reports of four separate seals caught in abandoned fishing nets. On their way back to mainland Shetland, the team heard of a second grey seal described as “completely wrapped up in green netting” on a beach near Bridge End, in Burra. 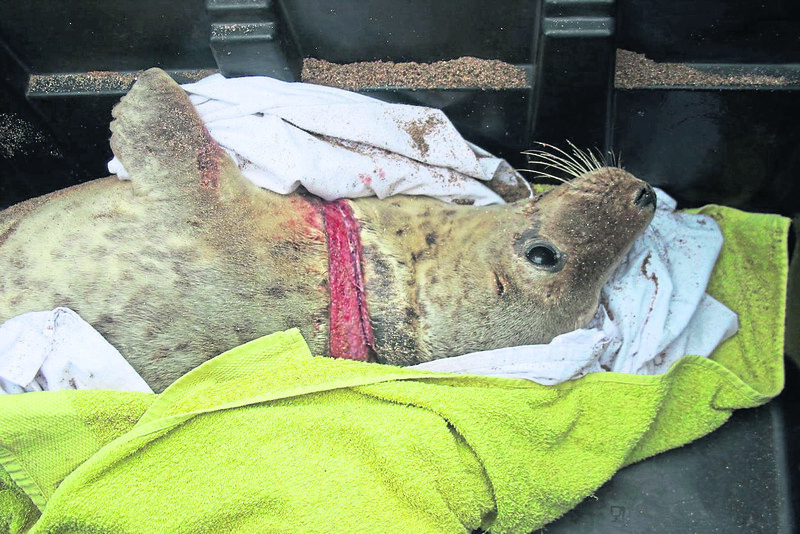 Sadly, the seal from Skaw died while they were on their way to Shetland Vets to collect medication. 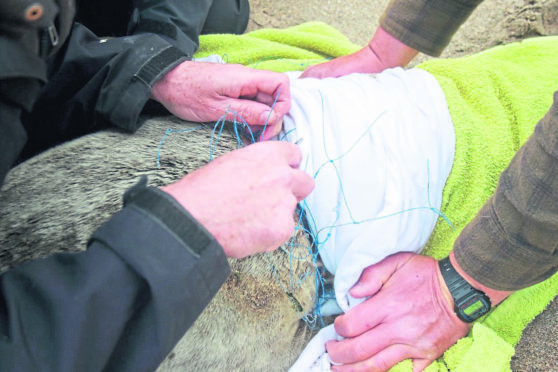 Meanwhile, the Burra seal had gone back into the sea and there was little the volunteers could do to help, though the seal with green netting around its neck could be seen from the shore. Jan added: “We know our local Shetland fishing fleet takes this issue very seriously and many local boats take part in the Fishing 4 Litter scheme which originated in these islands.